Many of us don’t even know that the term diamond cut does not refer to its shape. Sure, you have to cut a diamond to make a shape but when gemologists say, "diamond cut," they are talking about a gemstone's proportions, such as its depth and width and the uniformity of its facets – all characteristics that control brilliance, durability and other features we look for in a diamond. A good cut is an indispensable criterion for a diamond to be called beautiful. This is because the telltale sparkle of a good diamond always depends on its cut; therefore, it is obvious that even great clarity and color alone will not bring out the sparkle that makes diamonds famous. For the components of a diamond to interact properly with light, the diamond cut has to be just right. The relationship between depth and width has a great influence on the brilliance of a diamond which is nothing but the reflection of plain white light that comes out of a good diamond cut. A shallow diamond cut appears lifeless because it does not allow much play of light. When traveling through a diamond that has a shallow cut, the light does not bounce back into vision; it just gets lost through the stone’s bottom. Speaking of diamond cut, the term ‘symmetry’ implies the way in which the facets of the diamond are aligned. Facets are the polished, flat surfaces of the stone. A good cut of the facets makes for optimal light play. You've seen diamonds flash when you move them in the light – that effect is called scintillation, and it occurs when light bounces among the facets. If the diamond cut facets are aligned wrong or badly, this scintillation gets visibly reduced, or doesn’t happen at all. Diamonds that have misaligned facets affecting light play are usually graded by gemologists as Poor and Fair so far as symmetry is concerned. The facets or the cut surfaces of a good diamond should be polished to smoothness. This helps light to pass easily through them. A culet is the tiny facet at the bottom of a diamond. The presence of a culet helps to a large extent in avoiding damage to the diamond. The problem occurs when the culet is chipped, broken or off-center. Another problem is additional facets – more than the correct number that is needed. Misaligned facets are also considered unwelcome. Sometimes the girdle also poses a problem. Girdle is the technical name for the edge of the diamond, where its top and bottom portions meet. 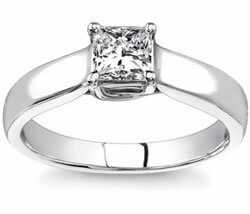 While mounting a diamond into a setting prongs are usually put around the girdle area. The problem occurs when the girdle is too thick or too thin. A girdle that is too thick means that it has poor proportions and a too thin girdle exposes the diamond cut to great risks of damage. Sometimes the girdle gets fringed with miniscule cracks radiating inside the diamond. To be absolutely sure that you get a good diamond cut, deal only with reputable jewelers. Ask as many questions as you want to about the components of the diamond. Demand to see as many stones as possible to be able to make an effective comparison.